The Longboat is light and elegant and can be sailed with ease and agility. She is 6.63m (21ft.9″) in length. With its clinker style construction, a feature of all our boats adds rigidity to the hull , as well as good looks. Fully rigged, there’s 15.97 sq mtrs (172sq ft ) of sail to power the boat through the water. A 6hp out board motor is recommended to use when the wind drops. The Longboat is roomy and stable enough for fishing expeditions. With a shallow draft, kick up rudder and steel reinforced stem, she is the ideal boat to explore coves and backwaters with alacrity. For a full specification plan please click HERE. For pricing and options click HERE or click on the picture in the bottom of the left hand column. 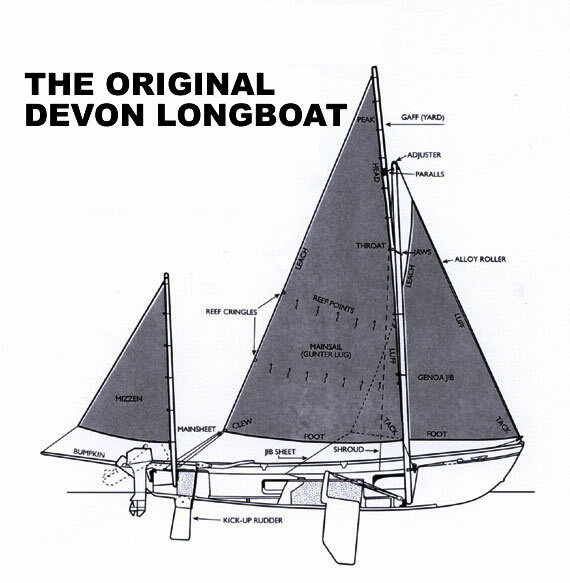 This boat was originally called the Drascombe Longboat and then re named to Original Devon Longboat.